After a week of listening and reading commentators on the issue of North Korea I am absolutely sick and disgusted with the incompetence of what passes for 'expert' these days. If you fancy yourself an 'expert' and you haven't read and formed an opinion on B.R. 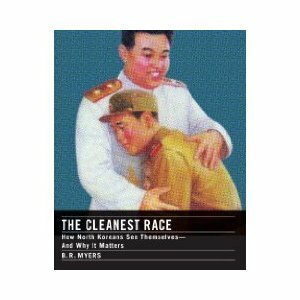 Myers, The Cleanest Race: How North Koreans See Themselves and Why It Matters, stop writing and giving interviews, and go get a copy and read it. I had the chance to meet Myers this year at a talk and slide show he gave at UC Berkeley. To paraphrase what he said (he used kinder language of course), the US State Department is clueless and stuck in the mud, unwilling to experiment with a novel practice called "thinking." We can only pray that a few military leaders have read his book by now. Anyway, I've lost my patience. If you don't know what you are talking about, shut up! Here is an hour long lecture with questions and slides he gave. And here is a Youtube snibit I haven't had a chance to watch because I'm sitting in a cafe without earphones, but it looks like a piece of the same lecture.